Original Recordings was Dan Hicks' initial solo effort as well as the debut of his "Hot Licks." Unlike the overamplified electric jug band music that the Charlatans had been creating during Hicks' stint as their drummer and occasional vocalist, this new band performed a refreshing blend of jazz swing with country & western. Their understated performance style stood in stark contrast to the burgeoning heavy metal and acid rock that were en vogue as the '60s became the '70s. Featured on this album is a seminal version of the "Hot Licks" that were only together briefly. Included are John Weber (guitar) and Terry Wilson (drums) as well as vocalists Tina Viola Gancher and Sherry Snow. Both Sid Page (violin/vocals) and Jaime Leopold (acoustic bass) would remain with Hicks (guitar/vocals/spoken word) as core members of the band. Of the 11 original compositions on this disc, "How Can I Miss You When You Won't Go Away" followed Hicks from the Charlatans, while "Canned Music," "I Scare Myself," and "Shorty Falls in Love" would be slightly reworked for their inclusion on the upcoming long-players Where's the Money? and Striking It Rich, respectively. Perhaps because of Hicks' background as a drummer, his sense of timing is a key element to his deceptively complex melodies. Likewise, this has a great deal to do with the success of the call-and-response vocals between Hicks and the female background vocalists he would dub "the Lickettes." Within these pastoral melodies and slightly askew lyrics is the somewhat out-of-sync and acid-tinged "It's Bad Grammar, Baby." In retrospect, the prominently distorted acoustic guitar lead overwhelms the track -- which would have otherwise fit nicely within the context of the remainder of the album. 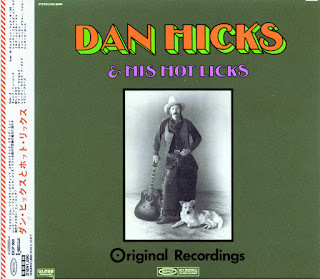 This might have had something to do with it being conspicuously left off the 2001 Sony/Legacy reissue Canned Music: The Most of Dan Hicks and His Hot Licks. Those who can locate a copy of these Original Recordings are urged to do so. For Hicks-ophiles or Dan-ophites, it is a vital entry into his canon.